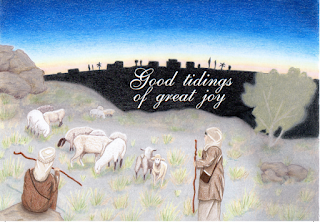 Features artwork inspired by photos of shepherds in Israel. The Son of God had always foretold. To shine in sin’s darkest deepest night. He was a babe, not King to receive! Such humble birth could not be contrived! But that wasn’t yet the most bitter cup. They stripped Him and His back did they smite. While He bore our sins with tender care. Three days and nights - He did not decay. The tomb was empty, save for His clothes! To heaven He went - His work perfected! Peace with God for mankind He has won. Will you this gift of God’s love accept? Colour artwork inside and on back of card..Size: 117 x 168mm.